The time in Britain is twelve noon, in Germany it's one o'clock, but home and away it's time for "Two-Way Family Favourites"
That was probably one of the most famous announcements on radio during the 1950s and '60s. At its peak it had an audience of 16 million in Britain alone. The programme started during the war as Forces Favourites. Jean Metcalfe along with Marjorie Anderson, Joan Griffiths and Barbara McFadyean presenting. After the war, the BBC determined to raise the moral tone of Family Favourites, as the programme had now become. Mention of fiancées and girl friends was declared taboo; there was to be no banter; and noisy jazz was forbidden on Sundays. A special edition, Two-Way Family Favourites, linked service personnel in occupied Germany with their families at home, and from 1947 Jean Metcalfe was the announcer at the London end. 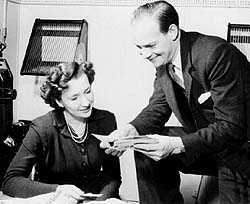 One morning early in 1949, she noted that the name "Michelmore" had been inked in as the replacement for Derek Jones, the usual presenter in Hamburg. Their conversations on the telephone link before going on the air soon took a flirtatious tone. That April, Michelmore came to London to meet her; and soon "the agreeable young man connected with our local church", to whom Jean Metcalfe had once been engaged, was wholly forgotten. But no hint of the romance was allowed to appear in Two-Way Family Favourites until after Cliff Michelmore had left the programme. They married in March 1950. On Two-Way Family Favourites, Jean Metcalfe came to command a weekly audience of 12 million. One of them even left her 3,000 pounds, which the Michelmores put towards the purchase of The White House, Reigate, in 1958. Some of the '50s British Forces presenters were: John Jacobs, Hedley Chambers, Don Douglas, Bob Boyle, Dennis Scuse, Bill Crozier and Derek Jones. The signature tune was "With a Song in My Heart" composed by Richard Rodgers with lyrics by Lorenz Hart. Orchestral arrangement by Andre Kostalanetz.